STU's only goal of the night. It finishes as it started way back in 1960's. A UNB win. On the strength of 4 powerplay goals, 2 in the final two minutes of play, UNB takes the Lou Chabot Memorial Game 5 to 1. UNB scored 2 goals in the first and another in the second period for a three goal lead heading into the final frame. The Tommies picked up the intensity in the third and played much better. Randy Cameron (Morehouse, Chermetiev) scored at 7:59 to cut the lead but penalty trouble late in the period derailed any hope of a comeback. 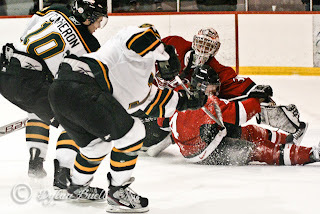 A "too many men penalty" and a questionable call of "hitting to the head" put STU down two men with under 3 minutes to play and UNB capitalized twice for the final of 5 to 1. I think I heard the old LBR whisper Goodbye to their old tenant UNB as they left the ice for the final time. Maybe not so much lately but we sure have had a lot of great games in the old barn with them. It's been fun when all is said and done. See you soon old Squirrel friends, a new setting will be the venue the next time we meet on our home ice.